Keeping up with employment regulations is complex work for any sized business. But good Human Resources guidance can help employers steer clear of costly lawsuits and legal fees. Fortunately, the Nebraska Human Resources Library, your solution to this problem, is easwww.hrsimple.com/shop/nebraskay to use and is now available. Since 2008, the Nebraska Chamber Human Resources Library has helped business owners and HR personnel find answers quickly. When the Human Resources Library will be updated - and you'll receive an email notice so you can easily determine what, if any, changes you need to make. For more information visit https://hrsimple.com/shop/nebraska/HR_Library ! 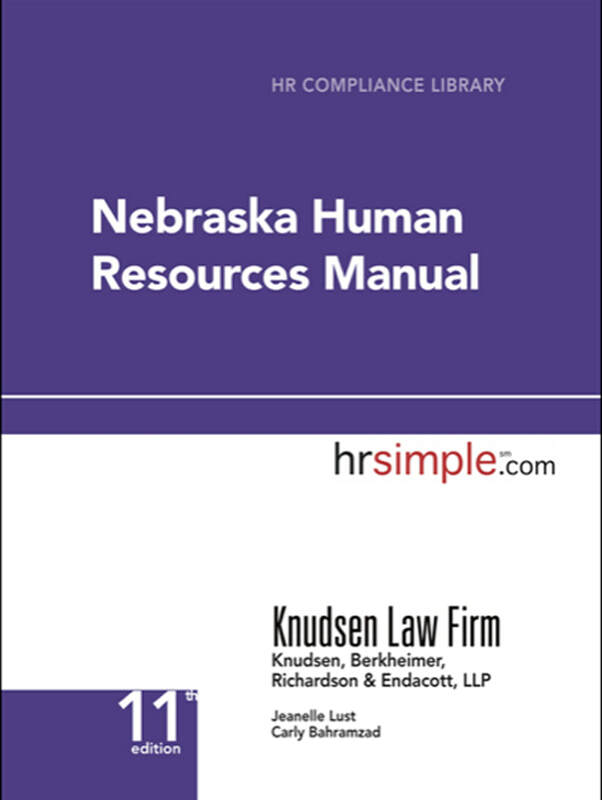 A hard copy book and online access to the Nebraska Human Resources Manual, which covers pre-hire to post-termination. It’s easy to use and you’ll be able to quickly find the HR answers you need. A comprehensive set of hundreds of policies and sample form templates to help you rewrite your HR manual and employee handbook. Access to HR Update, a weekly e-newsletter that lets you know what's new in the HR world every week. Free access to hrsimple webinars, where attorneys discuss complex employment law topics and help you deal with them. With hrsimple.com, you can effectively manage your most important resource - your employees. And as a member of the Nebraska Chamber, you will save 20% off any publication on hrsimple.com/NE. Add these valuable HR tools to your business! Visit hrsimple.com/NE or call (866) 439-2227 and use coupon code: nemem18 at checkout. The Nebraska Chamber of Commerce & Industry's Redbook provides a valuable set of indicators that track and evaluate the competitiveness of Nebraska's business climate. The Redbook contains more than 50 specific areas of measurement that help rank Nebraska compared to the other 49 states. The report notes such categories as taxes, R&D per capita, airport on-time performance and percentage of roads in need of repair to rank Nebraska's appeal as a place to do business. Additional copies of the 2017 Redbook may be ordered for $8 (price includes tax and shipping) each by contacting the Nebraska Chamber of Commerce & Industry, P.O. Box 95128, Lincoln, NE 68509-5128. Click link to the left view the current Business Resource Guide and Membership Directory. Unemployment Insurance tax is one of the few controllable business taxes employers must pay. UC Direct from TALX is a Web-based unemployment claim processing service that can help organizations save money by effectively managing their claims and potentially lowering their unemployment tax rate. This user-friendly tool prompts users with questions about an employee’s separation, leading to the most complete and effective claim response possible, resulting in fewer calls from the states and better win ratios. If you have any questions about the UC Direct solution, please contact Chad Mace at 314-214-7080 or cmace@talx.com.